Hi guys!!! Today we are having a look at Guitar Solo Scales. So first of all scales are the skeleton of music so as they vary so does the genre of music. Many students ask me how can I improvise?… I wanna do that!!!! Well it is based on scales and scale patterns but be careful, improvising is saying something you have never said before and, at the same time remember that people need to understand the words you use. When you are improvising you are not thinking in terms of scales but in terms of phrases, or may be in licks. A scale is the alphabet but when I want to make a sentence, for example, I don´t think which letters I´m going to use I think which words I will say, although I can’t help using letters, of course. The same happens with scales and soloing. I have students saying: I know the scale very well but it sounds terrible when I try to improvise….. We have all been there!!! As I say learn your scales, guys! But don´t base yourself only on scales! All these concepts can be applied also to arpeggios, chords, modes and all the tools that we normally use to create music. Learning them is absolutely necessary, nevertheless, we have to be aware that they can become a risk for our playing by limiting our creativity if you only play in a way where the scales make sense. So practice them, and practice them a lot, but also jam as much as you can, look for melodies, play random, and try not to make exercise-based solos. 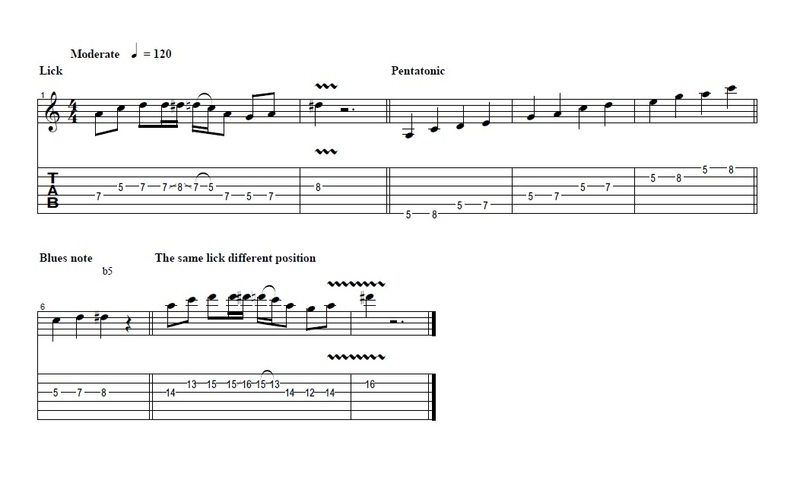 The examples are to show you how I would study a Lick and at the same time the scale pattern. To make it easy I´ll use A minor Pentatonic scale. (1) First the Lick, then I see where the lick stands over the pattern after doing this several times (2), I try to find the same lick in a different scale position (3)… As you can see if you really use this method any type of lick will be yours in no time!! !